AmWeek camp is chock-full of dancing for dancers and nonstop formal and informal music workshops for musicians, all day and every night. Spend all day dancing, or spend time in intimate small and personal sessions with world-class dance musicians. Or split your time and do both! There's something for everyone, and there's ample time available to rest and contemplate. Waltzes Before Breakfast: Start the day floating with this glorious traditional way to wait for breakfast to be served (check out our waltz music CDs from past years!). 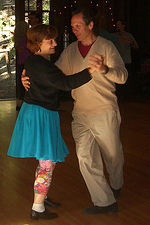 Come and dance, or bring your instrument and join us playing original waltz compositions in an open band along with other campers and members of our camp staff. Music so magical that we’ve released three CDs recorded at camp, performed by staff and campers! Contra Dances and More with Gaye Fifer and Sarah VanNorstrand: It’s what you’d expect at a dance camp — 3 sessions each day plus full evenings of dancing in the redwoods to fantastic music with your closest friends, old and new. Stretch Pilates with Jean Gibson-Gorrindo: Explore different modalities aimed at strengthening and lengthening, fine-tuning your body awareness and keeping your body happy and healthy during this action-packed week. Waltz & Couple Dancing with Gaye Fifer: Beginning Waltz, Advanced Waltz, Swing — There will be something for everyone, including the chance to share your favorite moves. Traditional Crafts with Rachel Olguin: Bring out your creative nature. Make your own custom-sculpted beautiful Mardi Gras leather mask, molded to your face for a perfect fit. Sew a simple skirt made from bandanas or scarves. Fun, colorful, and great for whirling and twirling! Singing with Shira Kammen: Each day something new: Grisly, dark & twisted, Love songs & constant sorrow, High & Lonesome, Nonsense Songs, Trains, Boats & Work. Fun! Dance Photography is camper led, organized by David Buesch: Open to everyone. Daily discussions on how, why, and when to photograph, and review daily photos from participants. Before dinner, share your hidden talents: sing, dance, play, or recite for the entertainment of your fellow camper community during our Round Up gathering at the amphitheatre. Each evening join the dancing with music and calling by our stellar staff. Dress up, dress down, but be prepared to dance up a storm. Or bring your instruments and join in the nightly staff-driven evening music session held in parallel with the dance. After the evening dance and parallel music session, party into the night at The Perkins Roadhouse, where the entire camp gathers for snacks, more music, dancing, crafting, games and late-night activities together in one room. Enjoy the variety of camper contributions and interplay that makes our dance community so special. Trash English has to be experienced to be understood! Best memory? … is it calling my 1st contra dance? Or, is it actually tango dancing? Or, is it every night, moving on a floor filled with a community of skilled and talented dancers and unbelievably good music!